We have received your em ails about how we were able to bring in our alcohol on our cruise back in February. Well first let’s explain….You see more often than not, cruise ships have a strict alcohol policy. These alcohol policies do differ according to the country under which the ships are. For instance, in England, liquor is served only to persons above the age of 18 while in the US, some cruise ships may allow up to two bottles per cabin. However, it is possible to sneak liquor into the cruise ship without being caught. These possible methods require some guts to do them. a) The Rum runner bottle technique: The use of rum runner flasks is one of the surest methods of smuggling booze into cruise ships since they can pass through the x-ray machines without being detected. These plastic flasks are quite inexpensive and you can part with as little as $9.50 for one flask or $29.90 for a six pack. One only needs to fill up to eighty percent of each of the bottles and squeeze out any air. Air is squeezed out to avoid bubbling that might make the ship crew suspicious when shaken. After completely sealing the flasks, these flasks are kept in the traveler’s suitcase. They should be stashed between soft items such as clothes and near other toiletries. It would be an advantage if you have several suitcases since if the bottles in one of the bags are found, the others in other suitcases are likely not to be found. It should be noted that the rum runner flasks should never be carried in carry-on bags as they are likely to be confiscated. b) The mouthwash/ shampoo bottle technique: This method is quite effective since no one would suspect that booze can be carried in mouthwash or shampoo bottles since these products are quite basic and every sailor is most likely to have them in their packing bags. It’s pretty much the best way to hide alcohol You are required to buy a bottle of mouth wash or shampoo, empty its contents and wash it thoroughly. After drying the bottles, you can fill them with your preferred drink of choice. If you have transparent shampoo bottles in which colored shampoos were packed, you need to add food coloring of the same color to your liquor. The downfall of this technique is the fact that some of these bottles may transfer the tastes of their initial contents to your booze. Alternatively, you can buy ‘shamp-booze bottles’ from shopping stores such as the amazon which will not contaminate your liquor with such funny tastes. However, they can be suspected if seen by the ship crew but will safely pass the x-ray detection machines. c) The water bottle technique: This is the most common method and merely requires water bottles whose cap seals are still intact. To have the caps intact, you can submerge a water bottle in boiling water and have the seal taken off using another water bottle. Once the water bottle has cooled off, put the liquor in the bottle and replace the cap carefully. The bottle cap being intact needs to obvious, since opened bottle caps may raise suspicion and can easily be confiscated and thrown away. We love sneaking drinks into a concert using this method. So my wife is an avid traveler. She is someone who just thinks about traveling all day everyday. We just came back from Cancun, Mexico and we stayed at the RIU Palace there. I had such a great time, I got a sunburn, swam, fed the crocodiles, and went to the downtown area. I recommend it if you decide to go on a vacation as this is the most fun I have had in such a long time (20 years). So now only two months later we are back at it, we are going on a cruise. We were looking at a Miami to the Bahamas or even Puerto Rico cruise, but we just saw the Caribbean. We live up by Burlington, Vermont so we decided let’s go to Canada. I know as an American those are the forbidden words laughing out loud. So regardless, we decided to go. We packed our bags and headed up to Canada. We wemt all the way from Montreal to Newfoundland and it only took about three hours. 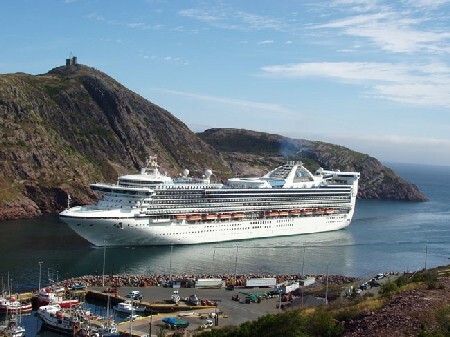 We landed in St. John’s were the Cruise lines are and we bought our tickets. No we didn’t buy in advance, we bought them there. You can usually get cheaper tickets that way if you don’t take a really popular cruise, sometimes it is around half the price. So my wife is a heavy drinker like me and we love to party. We didn’t worry about alcohol until we bought our tickets. We were informed that the cruise doesn’t allow alcohol of any kind unless it is purchase inside the cabin. I was furious! I knew how the prices are jacked up so I started to Google. I looked for the best way to sneak alcohol or booze on a cruise ship, but I couldn’t find anything. I kept searching though, not giving up I found www.myboozecruise.com. They have these flasks that are undetectable and are used to get past security and you end up having a cruise of your lifetime. So I purchased them and personally called the gentleman in charge (his number is in the contact page), he assured me he would have my package to me in one day. We had two days until the cruise was scheduled to take off – I was excited! In literally 18 hours I received my product and I felt like a kid let me tell you.